Sara Caldwell became a volunteer with the tutoring program at Montgomery Ward in the late 1980s. In 1990 she created a video that appeared on Channel 11 TV, titled "Cabrini-Green: What You Don't See", which told the story of the program that had been hosted by Montgomery Ward since 1965. Today she shared another video on Facebook, which she had created around 1991-1992. What Tutoring Means To Me 2 from Sara Caldwell on Vimeo. In the final portion of this video you can see me talking about building support for older kids than the 2nd to 6th graders who made up the core of the program. You can also see me talking about helping programs like the one at Wards grow in more places, supported by businesses throughout the city. In late 1992 myself and six other volunteers created Cabrini Connections to serve 7th to 12th grade youth. Between then and 2011 more than 700 teens participated, with a third staying involved for three to seven years. Many are now college graduates and working, and I'm connected to some on Facebook and LinkedIN. Below is a video that talks about that program. Cabrini Connections from Matt Lauterbach on Vimeo. 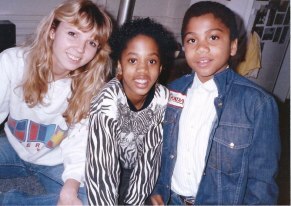 In 1993 we also created the Tutor/Mentor Connection, to achieve the vision I talked about in the first video, and help mentor-rich tutor/mentor programs grow in high poverty neighborhoods throughout the city and suburbs. 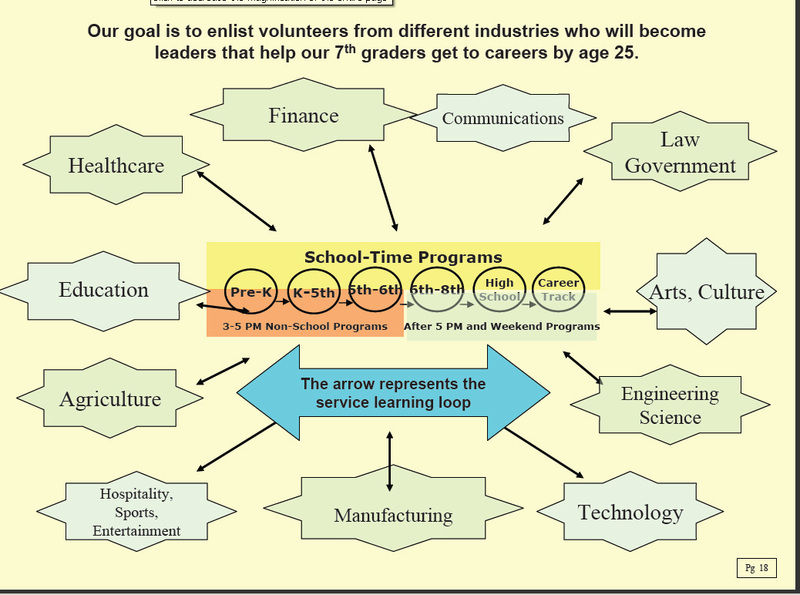 I've created maps and a wide range of visualizations to communicate the idea of programs that engage a wide range of volunteers in many roles, as a community of support that helps kids from first grade to first job. The two videos illustrate that this could happen through the efforts of multiple programs serving the same kids. Or it could be a single program. 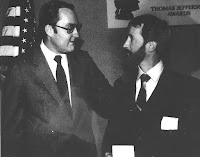 I began using the term "tutor mentor" in the 1980s to define what was happening in the programs I led. It was more than tutoring. It was more than mentoring. It was a core group of adults making a long-term commitment to helping kids grow up. In the presentation below I try to differentiate between the words "tutor" and "mentor" based on who it is that we're serving and the extra support kids living in high poverty neighborhoods of big cities need that other kids don't need. 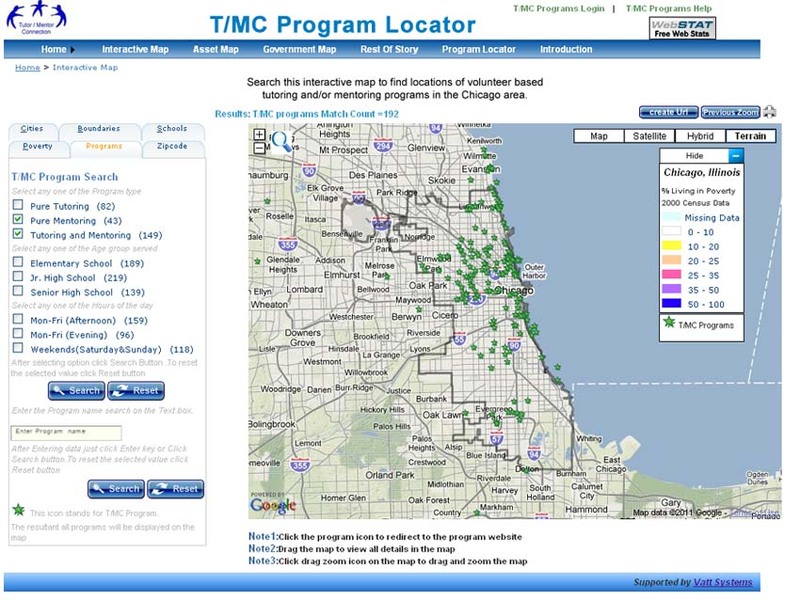 When I look at a map of Chicago, I want to see icons (green stars) in all high poverty neighborhoods, indicating that tutor/mentor programs are there. When I double click on the green star I want to be able to go to a web site where I see indicators, stories and videos showing a long-term commitment to a mentor-rich strategy. 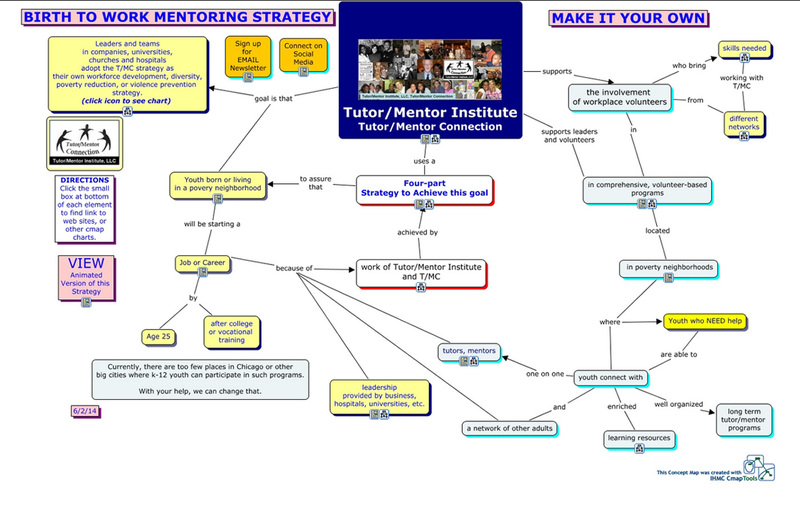 That commitment could be communicated using a strategy map graphic like the one below. This photo shows me in 1983 receiving the Jefferson Award for Community Service from Illinois Governor James Thompson. The videos and this photo show I've been doing this work for more than 30 years. That does not put me on the list of 25 heroes in mentoring, perhaps because I've always focused on more than mentoring, and more than tutoring, and on ways to build communities of workplace volunteers who provide a wide range of support to help kids in high poverty areas move through school and into work. I call this "tutor/mentor". Or "Total Quality Mentoring (TQM). In the first video I talked about enlisting companies from every industry to support the growth of these programs. We still need that type of leadership...supporting mentor-rich programs in multiple locations, not just one or two favored programs. 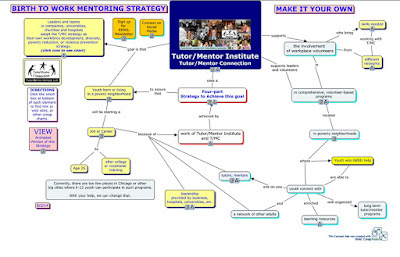 CEOs can demonstrate that commitment by putting a version of the strategy map on their own web site, with their photo/logo in the blue box, then enlisting teams of employees to support the growth of tutor/mentor programs the say way groups of employees support store locations in many places. Want to talk about this? Connect with me on Twitter, Facebook or LinkedIN.